Emerald Toucanet (Aulachorynchus prasinus) is the most broadly distributed of the toucans. There are approximately fourteen subspecies which can be found from southern Mexico south to northern Bolivia and southern Peru. The Emerald toucanet is one of seven species of “mountain toucanets”, all of which are mostly green, and vary in their beak and eyeskin coloration. The subspecies featured here(the only one in captivity), is found from, southern Mexico to southern Nicaragua, and is referred to as the white throated form. Mountain toucanets are found in the foothills and mountains of Central and South America at elevations from five hundred to seven thousand feet. Emerald toucanets(as are all toucanets) are much smaller versions of the large black toucans. They weigh approximately 175 grams, and reach a total length of only twelve inches, with the beak accounting for three. 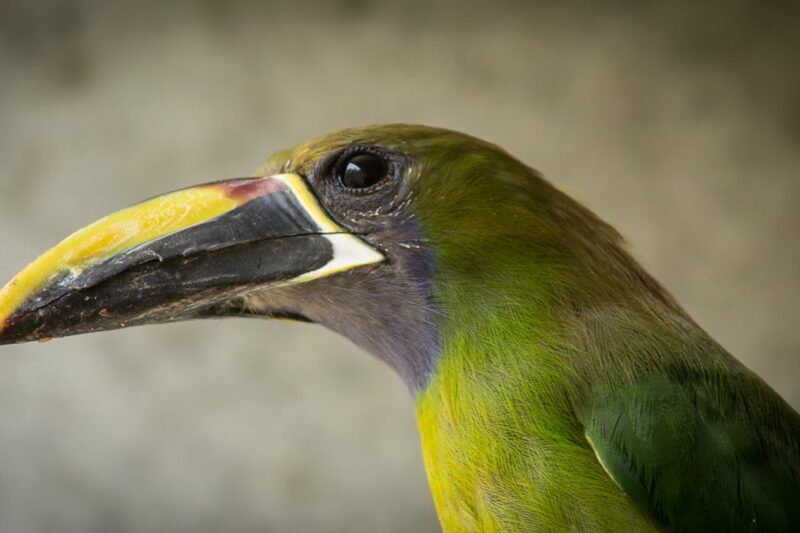 The Emerald toucanet has been a very popular bird in zoos and private aviaries. It is a free breeder, but aggressive to other birds. It is popular as a pet, is very intelligent and quite active. First captive breeding May 27, 1978; Jerry Jennings.